April 17, 1824 - A frontier treaty between the United States and Russia is signed, negotiated by the Secretary of State under James Monroe, John Quincy Adams. Russia agreed to set its southern border at 54 degrees, 40 minutes and allow U.S. ships within the one hundred mile limit of its Pacific territories. The Russian Tsar wanted to retain his rights to trade below the southern tip of the Alaskan panhandle, and manage the territory of Alaska, which was becoming difficult, but still possible. 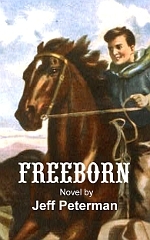 Their tenuous claim to territory in what was known as Oregon and any real military control by Russia below the panhandle was not going to be feasible with British, United States, and Spanish interests in conflict. The United States wanted Russia to afix a southern border to their, the Russian, territory of Alaska, and maintain focus on the Oregon territory and their dispute with Great Britain there, tenuously settled during the Treaty of 1818, but not permanently fixed until their Treaty of 1846. Russia had begun encroaching into North American territory during the decades before, and the Russian American Company urged Russian diplomats to regulate their territory to settle and trade starting in 1808. 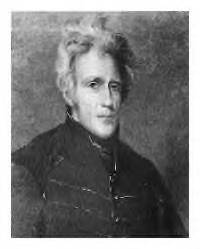 Even after the negotiations had been consumated with the 1824 treaty, it would still be forty years before Alaska became United States territory when President Andrew Jackson purchased it on March 30, 1867. In the end, the Russo American treaty gave Russia the rights to settle above the 54 degree 40' north latitude, that southern tip of the panhandle, and the United States rights to settle below it. Both nations would retain fishing and navigation rights in waters of both areas for a period of ten years. Did the treaty solve the boundary disputes? No. Perhaps it helped, but disputes remained. Some between the United States and Russia, but many between Russia and the British interests in Canada to the east of their claims north of the line and the coastal regions of today's British Columbia south of it. 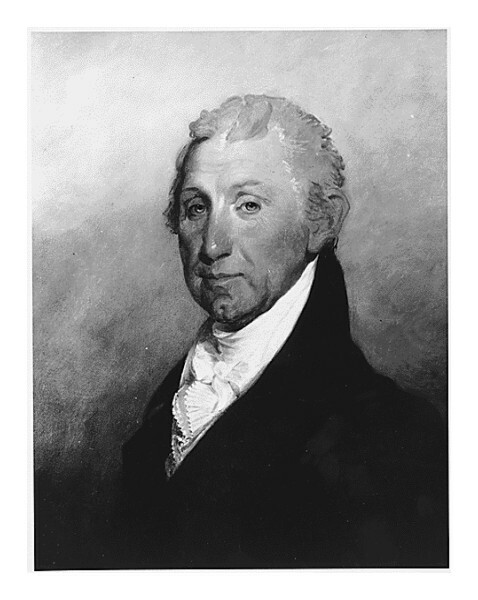 And how did President Monroe feel about the negotiated treaty? He stated, "A convention for the settlement of important questions in relation to the North West coast of this continent and its adjoining seas was concluded and signed at St. Petersburg on the 5th day of April last by the minister plenipotentiary of the United States and plenipotentiaries of the Imperial Government of Russia. It will immediately be laid before the Senate for the exercise of the constitutional authority of that body with reference to its ratification. It is proper to add that the manner in which this negotiation was invited and conducted on the part of the Emperor has been very satisfactory." And was the Senate, the body which has the right to approve or reject the resolution of ratification after the President negotiates, on par with the idea? 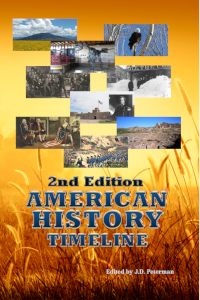 The United States Senate voted on January 5, 1825 by a margin of 41-1 in favor with 6 abstentions. The only no vote would come from Senator James De Witt of Rhode Island, a Republican. A two-thirds majority of the Senate is needed for approval of treaties as stated in the Constitution, Article II, section 2. April 17, 1824 - Signed by representatives of both nations in St. Petersburg. January 11, 1825 - Ratified by both nations. January 12, 1825 - Treaty went into effect. Convention Between the United States of America and His Majesty the Emperor of All the Russias, Relative to Navigating, Fishing, Etc., in the Pacific Ocean. The plenipotentiaries of the high powers who signed the treaty. The President of the United States of America, and His Majesty the Emperor of all the Russias, wishing to cement the bonds of amity which unite them and to secure between them the invariable maintenance of a perfect concord, by means of the present Convention, have named as their Plenipotentiaries to this effect, to wit: The President of the United States of America, HENRY MIDDLETON, a citizen of said States, and their Envoy Extraordinary and Minister Plenipotentiary near his Imperial Majesty: and His Majesty the Emperor of all the Russias, his beloved and faithful CHARLES ROBERT Count of NESSELRODE, actual Privy Counsellor, Member of the Council of State, Secretary of State directing the administration of Foreign Affairs, actual Chamberlain, Knight of the order St. Alexander Nevsky, Grand Cross of the order of St. Wladimir of the first class, Knight of that of the White Eagle of Poland, Grand Cross of the order of St. Stephen of Hungary, Knight of the orders of the Holy Ghost and of St. Michael, and Grand Cross of the Legion of Honor of France, Knight Grand Cross of the orders of the Black and of the Red Eagle of Prussia, of the Annunciation of Sardinia, of Charles III. of Spain, of St. Ferdinand and of Merit of Naples, of the Elephant of Denmark, of the Polar Star of Sweden, of the Crown of Wirtemberg, of the Guelphs of Hanover, of the Belgic Lion, of Fidelity of Baden, and of St. Constantine of Parma, and PIERRE de POLETICA, actual Counsellor of State, Knight of the order of St. Anne of the first class, and Grand Cross of the order of St. Wladimir of the second; who, after having exchanged their full powers, found in good and due form, have agreed upon, and signed, the following stipulations. ART I. It is agreed, that, in any part of the Great Ocean, commonly called the Pacific Ocean or South Sea, the respective citizens or subjects of the high contracting powers shall be neither disturbed nor restrained either in navigation, or in fishing, or in the power of resorting to the coasts upon points which may not already have been occupied, for the purpose of trading with the natives, saving always the restrictions and conditions determined by the following articles. ART II. With the view of preventing the rights of navigation and of fishing, exercised upon the great ocean by the citizens and subjects of the high contracting powers, from becoming the pretext for an illicit trade, it is agreed, that the citizens of the United States shall not resort to any point where there is a Russian establishment, without the permission of the governor or commander ; and that, reciprocally, the subjects of Russia shall not resort, without permission, to any establishment of the United States upon the Northwest Coast. ART III. It is moreover agreed, that hereafter there shall not be formed by the citizens of the United States, or under the authority of the said States, any establishment upon the Northwest Coast of America, nor in any of the Islands adjacent, to the north of fifty-four degrees and forty minutes of north latitude ; and that, in the same manner, there shall be none formed by Russian subjects, or under the authority of Russia, south of the same parallel. ART IV. It is nevertheless understood that during a term of ten years, counting from the signature of the present convention, the ships of both powers, or which belong to their citizens or subjects respectively, way reciprocally frequent without any hindrance whatever, the interior seas, gulphs, harbours, and creeks upon the coast mentioned in the preceding article, for the purpose of fishing and trading with the natives of the country. ART V. All spirituous liquors, firearms, other arms, powder and munitions of war of every 'kind, are always excepted from this same commerce permitted by the preceding article, and the two Powers engage, reciprocally, neither to sell, nor suffer them to be sold to the natives by their respective citizens and subjects, nor by any person who maybe under their authority. It is likewise stipulated that this restriction shall never afford a pretext, nor be advanced, in any case, to authorize either search or Retention of the vessels, seizure of the Merchandise, or, in fine, any measures of constraint whatever towards the merchants or the crews who may carry on this commerce the high contracting Powers reciprocally reserving to themselves to determine upon the penalties to be incurred, and to inflict the punishments, in case of the contravention of this article, by their respective citizens or subjects. ART VI. 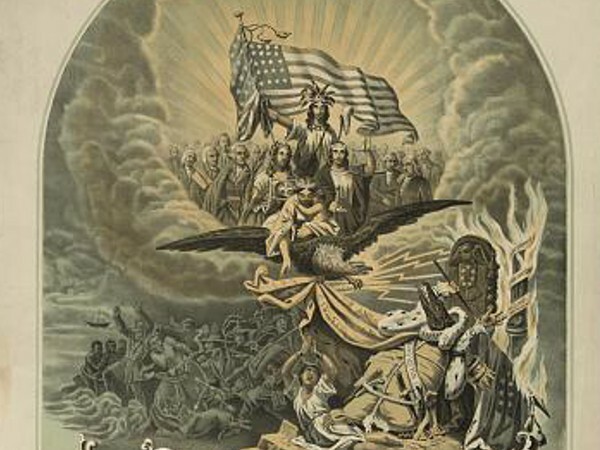 When this Convention shall have been duty ratified by the President of the United States, with the advice and consent of the Senate on the one part, and on the other by his Majesty the Emperor of all the Russias, the ratifications shall be exchanged at Washington in the space of ten months from the date below, or sooner if possible. in faith whereof the respective Plenipotentiaries have signed this Convention, and thereto affixed the seals of their arms. Done at St. Petersburg, the 17 (5) April of the year of Grace one thousand eight hundred and twenty-four. [L.S.] Le Comte CHARLES DE NESSELRODE. 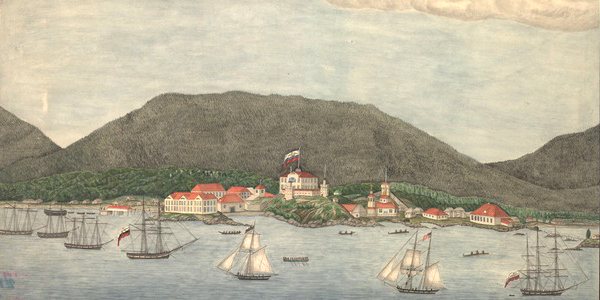 Image above: Drawing of New Archangel (present day) Sitka, in Russian Alaska territory, July 1837, Aleksandr Olgin 1837. Courtesy Wikipedia Commons. 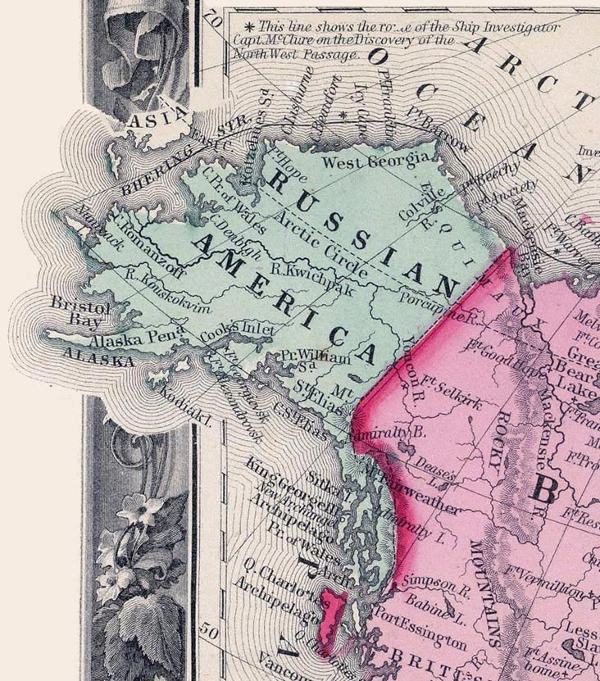 Image below: Russian American border 1860, 1860, Map of North America, Mitchell's New General Atlas, S. Augustus Mitchell. Courtesy Wikipedia Commons. 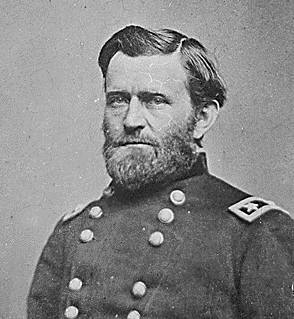 Source Info: The Free Dictionary; Wikipedia Commons; History.stackexchange.com; stateoftheunionhistory.com; govtrack.us; senate.gov.